What is the potential of gene therapy for your patients with inherited retinal diseases (IRDs)? Gene therapy research is advancing. For more than 50 years scientists have been investigating and evolving gene therapy with the goal of treating or possibly preventing genetic disease. In the last few decades, research has produced dramatic improvements in the ability to identify mutated genes and diagnose genetic disorders. Advancements in gene therapy research are raising the potential to address genetic disease.7 See what your patients are learning about genetic testing. Gene therapy vs. cell therapy. Video: The history and focus of gene therapy research. 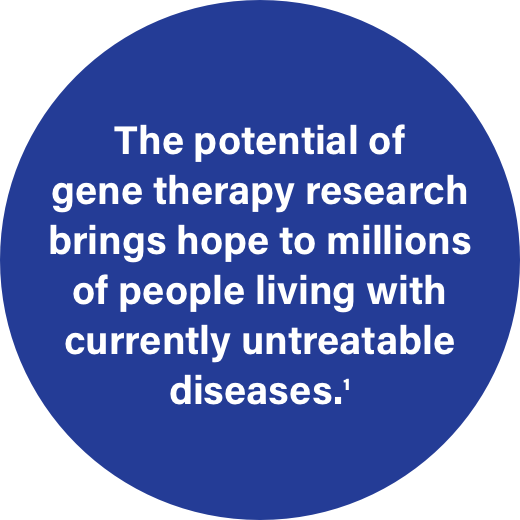 How is gene-based therapy delivered? Emerging developments in gene therapy research, such as using vectors to introduce genetic material in the target tissue, reinforce the importance of genetic testing for your patients with IRDs. Sign up and receive inspiring stories of hope from the IRD community. O’Reilly M, Kohn DB, Bartlett J, et al. Gene therapy for rare diseases: summary of a National Institutes of Health workshop, September 13 2012. Hum Gene Ther. 2013;24(4):355-362. Food and Drug Administration, US Department of Health and Human Services. Guidance for industry: gene therapy clinical trials–considerations for the design of early-phase clinical trials of cellular and gene therapy products. https://www.fda.gov/downloads/BiologicsBloodVaccines/GuidanceComplianceRegulatory Information/Guidances/CellularandGeneTherapy/UCM564952.pdf. Published June 2015. Accessed August 22 2017. Bender E. Gene therapy: industrial strength. Nature. 2016;537(7619):S57-S59. Phases of gene therapy clinical trials. J Gene Med. http://www.wiley.com//legacy/wileychi/genmed/clinical/. Updated August 2016. Retrieved February 24, 2017. Scherman D, ed. Advanced Textbook on Gene Transfer, Gene Therapy, and Genetic Pharmacology: Principles, Delivery and Pharmacological and Biomedical Applications of Nucleotide-Based Therapies. London, UK: Imperial College Press; 2014. Friedmann T. Changing roles for academia and industry in genetics and gene therapy. Mol Ther. 2000;1(1):9-11. High KA. The Jeremiah Metzger Lecture: gene therapy for inherited disorders: from Christmas disease to Leber’s amaurosis. Trans Am Clin Climatol Assoc. 2009;120:331-359. American Society of Gene & Cell Therapy. Gene therapy and cell therapy for diseases. http://www.asgct.org/general-public/educational-resources/gene-therapy-and-cell-therapy-for-diseases. Accessed November 10 2016. Wirth T, Parker N, Ylä-Herttuala S. History of gene therapy. Gene. 2013;525(2):162-169. 22. Food and Drug Administration, US Department of Health and Human Services. Guidance for industry: gene therapy clinical trials–observing subjects for delayed adverse events. http://www.fda.gov/downloads/BiologicsBloodVaccines/GuidanceComplianceRegulatoryInformation/Guidances/CellularandGeneTherapy/ucm078719.pdf. Published November 2006. Accessed November 11 2016. Kotterman MA, Schaffer DV. Engineering adeno-associated viruses for clinical gene therapy. Nat Rev Genet. 2014;15(7):445-451. Mayo Clinic Gene Therapy Overview. http://www.mayoclinic.org/tests-procedures/gene-therapy/home/ovc-20243692?p=1. Published September 2016. Accessed August 22 2017.